The chapel of St Athanasius Orthodox Church, circa 2009. Nine years ago, a tiny transformation occurred. 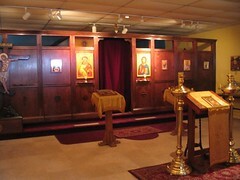 Christ the Life-giver Orthodox Church in Nicholasville, Ky., formerly a mission of the Evangelical Orthodox Church (EOC), entered the Orthodox Church in America (OCA). Unlike other parishes that entered at the same time, every single member of Christ the Life-giver chose to remain with the parish in its transition to the OCA, an amazing detail that is sometimes forgotten. In the days that followed, a new name (Saint Athanasius) appeared in the window, and the layman who was formerly the priest would again be ordained to lead the tiny band of pilgrims. To better understand the place of that decisive moment in the history of the parish, I present it here through the lens of my own life. My story begins in 1995, when I entered the Roman Catholic Church. Before that, I was an evangelical, and I continued to attend an evangelical college. One of my art professors began reading about Eastern Orthodoxy and attending prayers held in the living room of a nearby seminarian, David Rucker. Rucker was studying missiology. He served in Hong Kong, and he was frustrated over inadequate responses to ancestor veneration in Asian cultures. He believed that Eastern Orthodoxy could provide a positive answer for Asians. My professor’s interest piqued my own, and I began attending the Sunday evening prayers. In the fall of 1995, Rucker began holding catechism classes. He invited me to attend, and I did.